Our latest print issue features the following stories. They are now on-line as well. 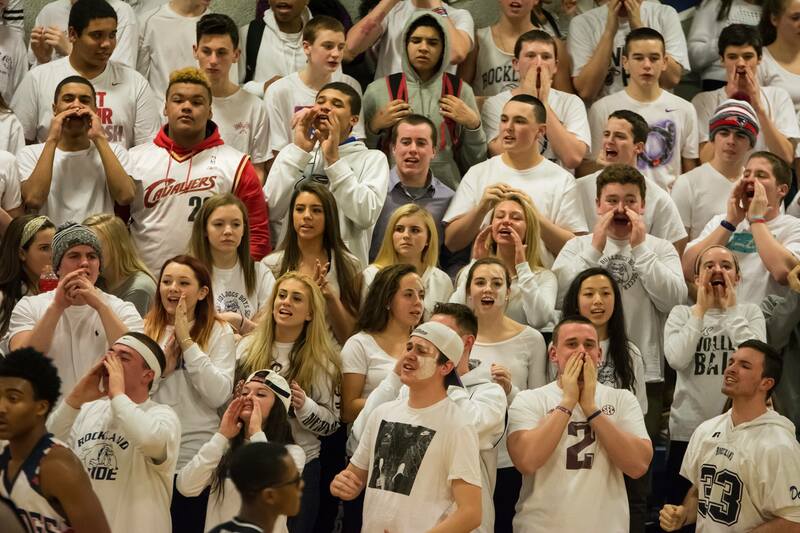 Taunts, chants and cheers: Are they offensive or part of the game? Two Veritas reporters give their opinions about the recent controversy over the taunting at a local high school tournament game between Newton North and Catholic Memorial. The fans were barred from attending the following game because of the racist taunts. Website link to Zach Pransky and Greg Makarski’s pro/con opinion stories are now available. Adiza Alasa and Joe Taft talked to the spring coaches and athletes to get their take on how baseball, softball, tennis, track and lacrosse teams will fare this season. Go Dogs! Click on reporters’ names to link to their stories. Reporter Mike Ivanoskos continues his series on RHS graduates: Where Are They Now? In this story, Mike interviews Julia Rayberg, Class of 2011, who has started her own non-profit company called Worthy Village. Read this story here. Julia with children in village where her team of volunteers teach about hygiene. photo courtesy of Julia Rayberg. Don’t Miss Out on this issue; it will be our best yet and may even sell out!!! 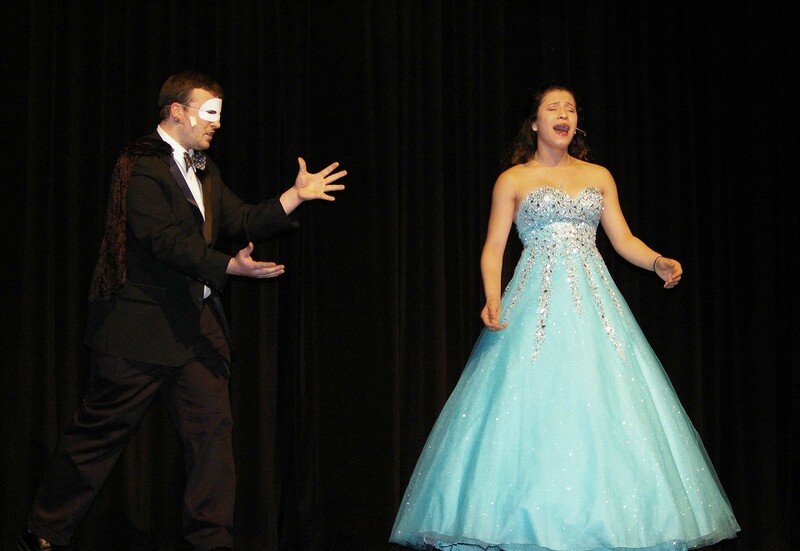 Cameron Estrella and Genesis Rojas in “Phantom of the Opera” last year. The Music Department’s annual Broadway Night will be held next Friday night (April 1) at 7 pm in the high school auditorium. The chorus and band students will be playing and singing excerpts from Rent and Into the Woods. Last year the Music Department wowed the crowd with selections from South Pacific and Phantom of the Opera. Traditionally the band opens up the show and then members of the chorus act, sing and dance to selections of their choosing. Don’t miss it! The cost is $5. Link to a review of last year’s show with photo gallery! 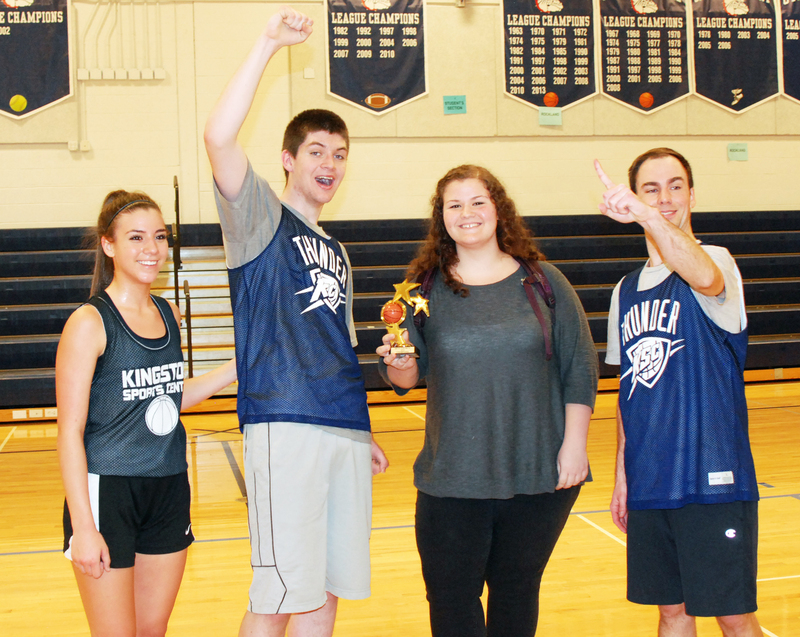 The team called “Who’s the Teacher?” took home the championship trophy for the Nets for Nets three on three basketball tournament. The tournament was a fundraiser for an organization called Nothing but Nets. This organization helps to fight malaria in third world countries. The tournament was held on Weds. March 16 in the high school and middle school gyms. Junior Shannon Lindahl and English teacher Kristen Walsh came together with the idea of a fundraiser to help donate to this cause. 20 teams made up of middle and high school teachers and students battled in a double elimination tournament that featured some intense games. On the winning team, SSL all-star three point shooter, Danielle O’Brien and boys varsity center, Aiden Glennon owned the outside and inside game with Social Studies teacher, Brian Smith directing the play at the point. “They both played fantastic. Danielle was hitting shots from Steph Curry range…Aiden was taking care of every person down low,” said Mr. Smith. Though Mr. Smith denied having played well, he scored when his team needed it and outworked his opponents for clutch rebounds. “Mr. Smith was the best rebounder in the tournament,” said Glennon. For all the details on the tournament, see the next issue of the Veritas on sale April 1. 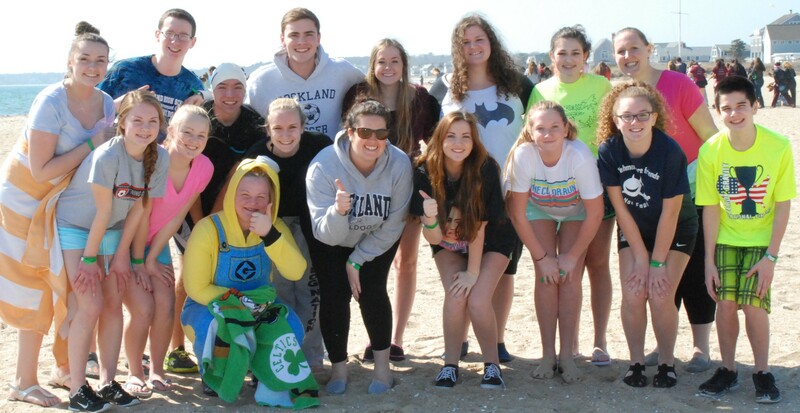 Follow this link to a Photo Gallery that includes pictures by Haley Macray and Hannah Boben. 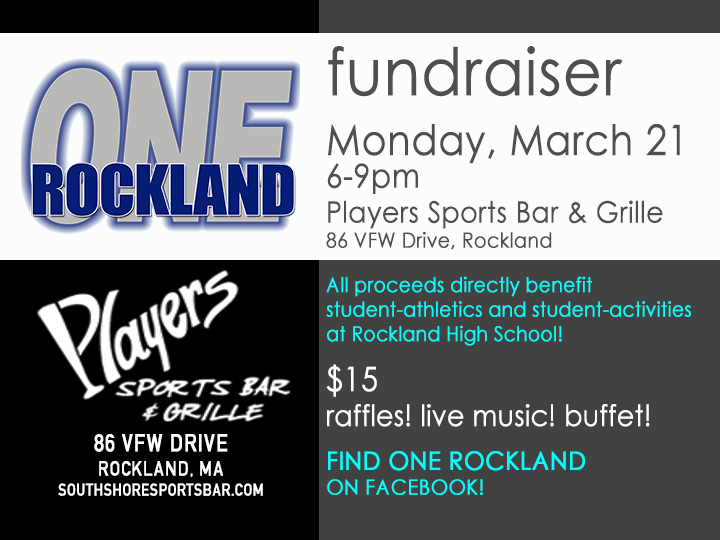 One Rockland is holding its third fundraiser of the year Monday night from 6-9 pm at Players. All proceeds of these fundraisers go to the sports teams and clubs and organizations at Rockland High School. There will be raffles again, and a great buffet. All are invited to come for a short time or to stay all night! The Irish holiday of Saint Patrick’s Day is celebrated annually on March 17th. What was once celebrated as a religious feast day has become a date on which Irish culture is demonstrated through holding town-wide parades, taking part in Irish Step Dancing, eating special Irish food and representing the culture by wearing as much green as possible. The figure whom the holiday was named after is ‘the Apostle of Ireland’ Saint Patrick himself. He was born around 460 A.D. In his early life, we’ve learned through his letters, he was captured in the city of Wales, Scotland which is just outside of Ireland. There he was made a slave. It was not until years later that he was able to escape and make a return to his family. Patrick’s family was made up of Romans who lived in Britain. It was finally around the 600’s that he returned back to the country of Ireland to continue his missionary work within the Christian faith by becoming a Cleric then a Bishop. Through this he became known as the Patron Saint of Ireland. Another popular legend is that Saint Patrick banished snakes from Ireland. The story entails him fasting and getting attacked by a swarm of snakes. As a result he proceeded to chase the snakes successfully back into the ocean. It is hard for people to believe in this legend because of the rarity that such an event could occur. There are no accounts of snakes spotted throughout the post- glacial period in Ireland. Another legend has St. Patrick sticking a walking stick into the ground while evangelizing, which turned into a tree. St. Patrick’s Day was first celebrated in America in 1737, organized by the Charitable Irish Society of Boston, including a feast and religious service. This first celebration of the holiday in the colonies was largely to honor and celebrate the Irish culture that so many colonists had been separated from. The biggest traditions that do not seem to be fading anytime soon are people sporting the color green and the holding of the annual St. Patty’s Day Parades. 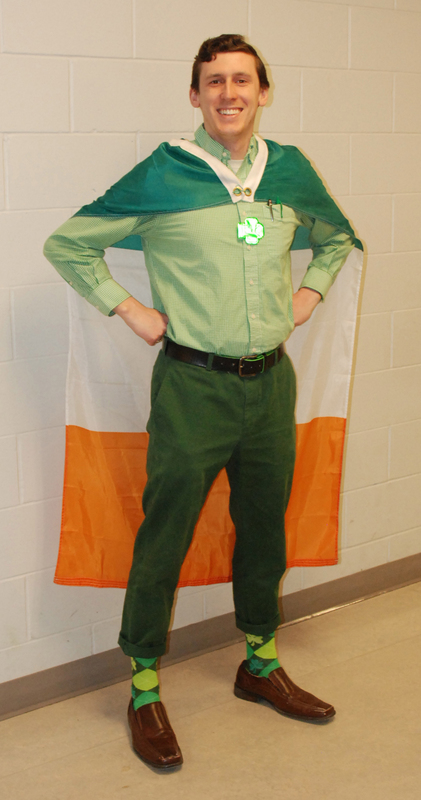 To learn more about why Saint Patrick’s Day is so important and such a special occasion to the people who are truly Irish, we went out and interviewed a couple faculty members about Saint Patrick’s Day. The first person we interviewed was Mr. Finn who is one of the foreign language teachers at Rockland High. He teaches both French and Spanish but he is most definitely Irish. This year Mr. Finn is excited to participate in a road race that takes place in South Cambridge called the Craicfest 5k. Mr. Finn says, “I really enjoy running anytime I can, especially on the Charles River, and there is also a party after the race.” It is important to note that “Craic” is an Irish word that translates to having a fun time. The second person we interviewed was Ms. Lauren Sullivan who is another one of the foreign language teachers here. She is one of the Spanish teachers. A special thanks to Mr. Finn and Ms. Sullivan for being such great interviews. Thanks to them for giving us more insight on why Saint Patrick’s Day is such a special day. We at the Veritas wish you a happy St. Patrick’s Day. See more at about St. Patrick’s Day here. 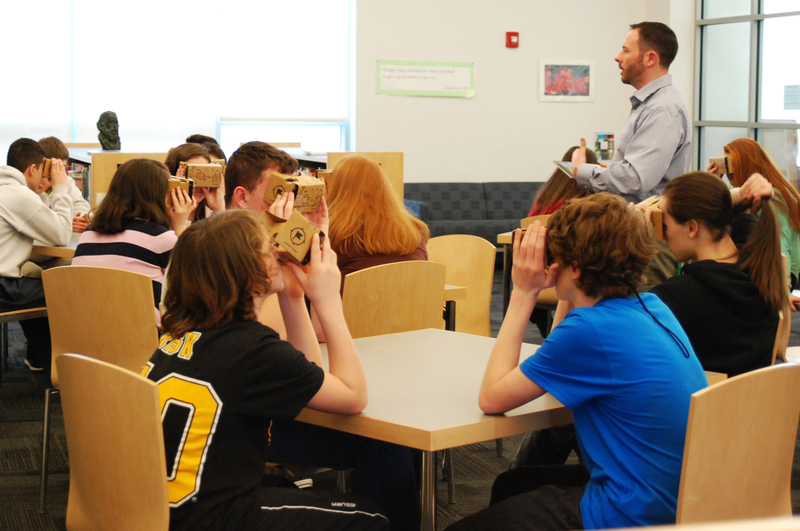 On Tuesday, March 8, Google Expeditions representative, Kristen Thomas came to Rockland’s Rogers Middle School to give 6th grade students what they refer to as a 360 degree virtual reality experience. Two high school classes also had the opportunity to participate. Michael Bodley and Nicole Raymond, two students in the Pathways class at Rockland High use their Google viewers to visit the the Great Barrier Reef, the Grand Canyon, and an ocean habitat on March 8. photo by Haley Macray. Joanne White’s Pathways students were able to explore the Great Barrier Reef, the largest coral reef in the world and one that is visible from outer space. They also explored the Grand Canyon and many other habitats. In the morning 6th graders had visited the library where they were led on their Google Expeditions of the Tolbachik Volcano in Russia. When first looking into the devices, students reacted with audible “ooohs” and “ahhhhs,” filling the library. According to Thomas, that is exactly what the Google Expeditions Pioneer Program is trying to achieve. 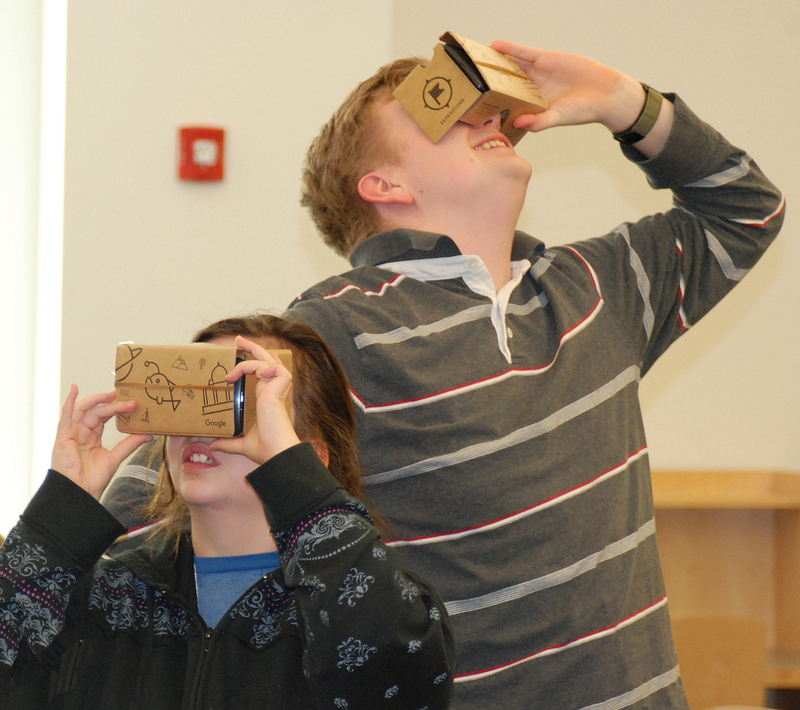 With each of these cardboard viewers students take a virtual reality, panoramic trip to places such as the Tolbachik Volcano in Russia, the pyramids in Egypt and the Grand Canyon. In each of the 20 half hour sessions, teachers were able to guide each student and explain different aspects of the places that students wouldn’t be able to see by just looking at a textbook. She also said that this virtual explorer could be included in a variety of classes and further help students learn about certain subjects and landscapes. Thomas said that the program will be available in the fall for schools to purchase. Google will be returning to Rockland on April 1 when 4th and 5th graders will be participating along with several more high school classes. Leah Ouderkirk, RMS science / geography teacher leads an expedition for her 6th grade students. 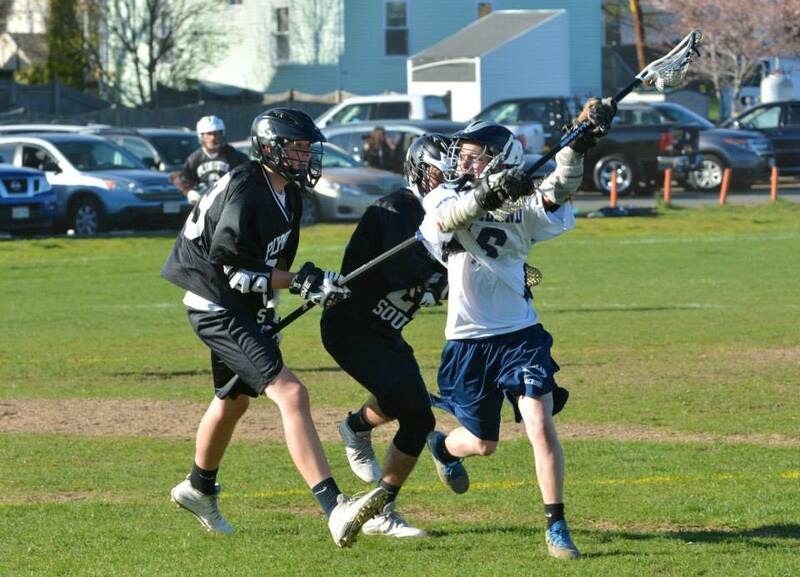 Ryan Struzziery, sophomore in Mr. MacAllister’s class. photo by Haley Macray. Michael Bodley and Nicole Raymond, two students in the Pathways class at Rockland High use their Google viewers to visit the Grand Canyon, and an ocean habitat on March 8. photo by Haley Macray.